Preheat oven or toaster oven to 450F/230C. Spray either one large casserole dish, three medium gratin dishes, or six individual gratin dishes with olive oil or non-stick spray. Open black beans and drain into a colander placed in the sink, then rinse with cold water until no more foam appears. Let beans drain while you saute onions. 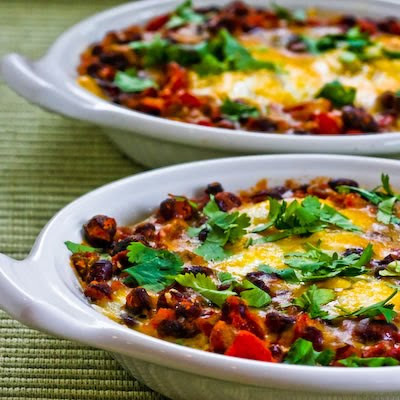 Decide whether you're making one large casserole with 6 eggs, 3 medium casseroles with 2 eggs, or 6 individual casseroles with 1 egg, and spray dishes with olive oil or non-stick spray. Spoon a small amount of the tomato-bean mixture in the bottom of each dish (use about half the mixture.) Carefully break the eggs on top of the tomato-bean mixture. Spoon the rest of the mixture around eggs, avoiding the yolk. Bake the casserole or gratins about 5 minutes, or until the eggs are starting to look set but are still fairly wet looking. (Edit, this will take longer in a large casserole dish.) Remove dish(es) and change oven or toaster oven to broil (Be careful not to burn yourself!) Sprinkle cheese over the top and put dish(es) back in close to the broiler for 2-3 minutes, or until the cheese has melted. Be sure to remove while egg yolk is still soft. Serve hot, with whole wheat flour tortillas to dip into egg. Also good with salsa and sour cream served with it.